You scream, I scream, we all scream for ice cream! There is no better way to cool down in the summer than having a tasty scoop of ice cream in your favorite flavor. Instead of the traditional summer BBQ for your next summer party plan an ice cream social party for everyone to indulge in their favorite sugary treat. Here are 12 ice cream DIY ideas perfect for any summer party. If you are having an ice cream themed party these cute printable ice cream gift tags are the perfect way to incorporate the ice cream theme on the wrapped gifts as well. 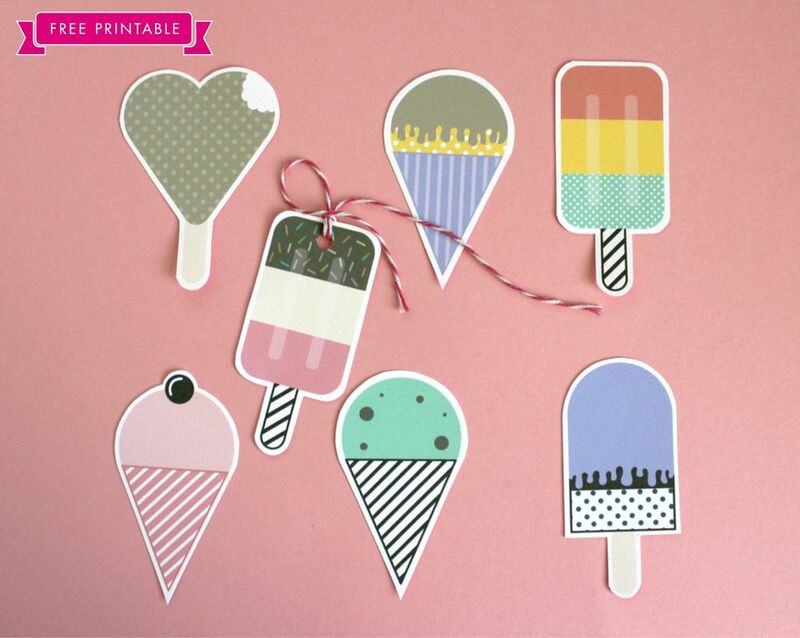 Another idea is to use these adorable ice cream tags to package up favors for all the guests at the party. Either use store bought or homemade paper honeycomb balls to form the ice cream and sheets of card stock curled into a cone shape to create a series of ice cream cones that can be strung together to create an ice cream cone garland. These individual sized ice cream cones are perfect for your next summer party. Create one per guest and leave it at each seat for everyone to have their own candy-filled pinata to break. Create an affordable and fun ice cream stand play area for children this summer by crafting paper models of ice cream cones that your child and friends can play with all summer long with any worry of their ice cream melting. If you are having a backyard ice cream party make sure to hang these super easy to make DIY ice cream cones out of colorful paper lanterns and sheets of tan cardstock which you can hang from your deck or pergola. Grab some small paper lanterns and sheets of card stock and head to DIY Inspired to read the tutorial on how to make your own DIY ice cream cone paper lanterns. For a unique spin on the traditional party hat why not craft some ice cream cone headbands using ice cream cones to form the traditional party hat shape? Learn how to attach your ice cream cone to a headband by reading the tutorial at One Charming Party. Kids and some adults love to play with noise makers at parties, and these DIY ice cream cone blow horns are the perfect way to announce it is time for ice cream. These cute DIY ice cream cone blow horns are made using a Cricut, and the full DIY instructions can be found at Love The Day. For some fun party entertainment at your summer party have everyone take turns smacking a giant ice cream cone pinata which you can fill with your choice of candy. Learn how to make your own giant ice cream cone pinata out of poster board and tissue paper over at Lilyshop. Mailed party invitations always help build anticipation for a party, so for your upcoming ice cream social party DIY your own invitations to invite your guests. The downloadable template for the ice cream social invitations can be found at A Pair Of Pears. These charming party hats that look like ice cream cones would be a fun addition at any child's birthday party.The party hat templates are available for free and using your Cricut you can easily cut out the custom design and top the hats with crepe paper streamers to make the hats extra fun. The DIY ice cream cone hat template and DIY instructions are available at Love The Day. Do you scream for ice cream? If so you might be a big enough fan of the cold dessert to want to surprises everyone by showing your family and friends by showing up at your next summer party sporting your own handmade ice cream cone costume complete with the cherry on top. For the true lovers of ice cream head on over to Studio DIY to learn how to make your own DIY ice cream cone costume. Kids will adore these ice cream cone balloons that they can hold which are made by adding a paper cone to the bottom of a small inflated balloon. Learn how to make your own bunch of DIY ice cream cone balloon sticks at Oh Happy Day.